The material of this section is based on the following reference: [Fle87]. 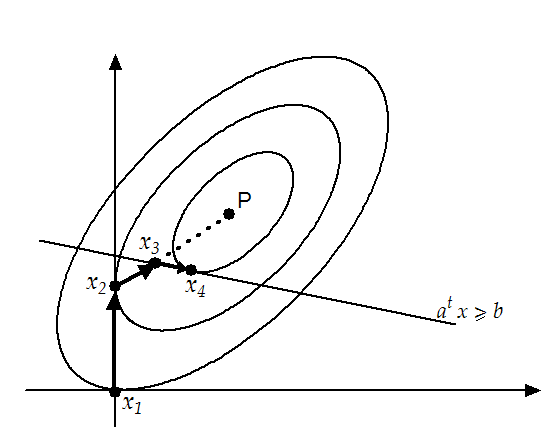 where are the components (or reduced variables) in each reduced coordinate direction (see Figure 9.1). have the correct properties. Moreover the vector in equation 9.3 and figure 9.2 is orthogonal to the constraints. 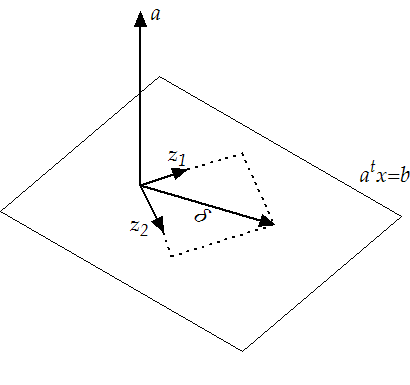 The reduced coordinate directions are also mutually orthogonal. is calculated by forward substitution in followed by forming . The multipliers are calculated by backward substitution in . Compute the Lagrange multipliers . If for all constraints then terminate. Remove the constraints which have negative . Solve 9.13 and activate a new constraint if necessary. set and go to (2). 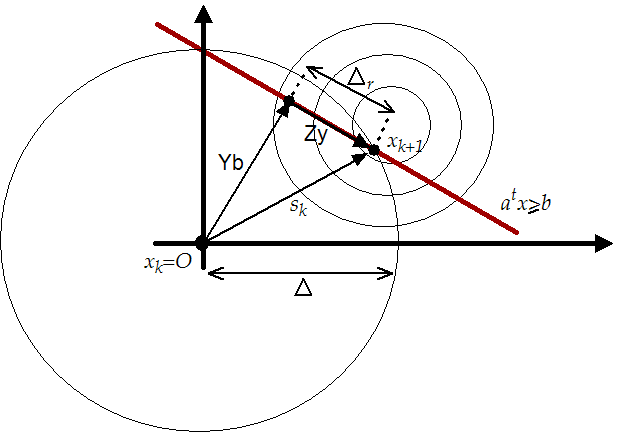 An illustration of the method for a simple QP problem is shown in figure 9.3. In this QP, the constraints are the bounds and a general linear constraint . 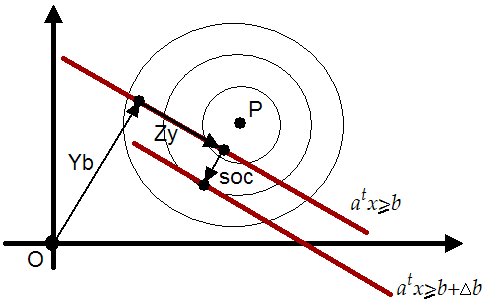 This problem can be solved by means of the gradient projection method, which normally allows us to identify the active set more rapidly than with classical active set methods. The matrix is semi-definite positive when is positive definite. This is good. Unfortunately, if we have linearly dependent constraints then the matrix becomes singular (this is always the case when ). This lead to difficulties when solving 9.16. There is, for example, no Cholesky factorization possible. My first algorithm used gradient projection to identify the active set. It then project the matrix into the space of the active constraints (the projection is straight forward and very easy) and attempt a Cholesky factorization of the reduced matrix. This fails very often. When it fails, it uses "steepest descent algorithm" which is sloooooooow and useless. The final implemented QP works in the primal space and use QR factorization to do the projection. The solution to the EP (equation 9.12) is computed in one step using a Cholesky factorization of . This is very fast but, for badly scaled problem, this can lead to big rounding errors in the solution. The technique to choose which constraint enters the active set is very primitive (it's based on equation 9.13) and can also lead to big rounding errors. The algorithm which finds an initial feasible point when the given starting point is infeasible could be improved. All the linear algebra operations are performed with dense matrix. This QP algorithm is very far from the "state-of-the-art". Some numerical results shows that the QP algorithm is really the weak point of all the optimization code. Nevertheless, for most problems, this implementation gives sufficient results (see numerical results).